To get access to dozens of graphs and tables on telehealth and telemedicine, order your copy of 2013 Healthcare Benchmarks: Telehealth & Telemedicine, today for $117. 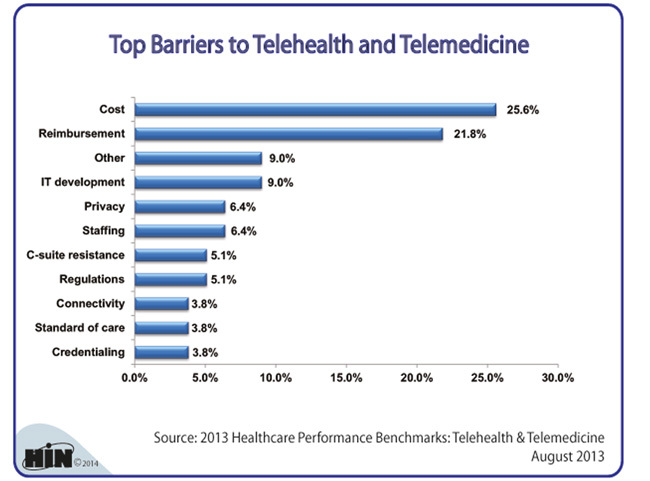 2013 Healthcare Benchmarks: Telehealth & Telemedicine is packed with actionable information from more than 125 healthcare organizations on their utilization of telehealth & telemedicine. This 60-page report, now in its third year, documents trends and metrics on current and planned telehealth and telemedicine initiatives and includes a year-over-year comparison of telehealth trends from 2009 to present. 2013 Healthcare Benchmarks: Telehealth & Telemedicine is available for $117 in our Online Bookstore or by calling toll-free (888) 446-3530. Listen to Susan Lehrer, RN, BSN, CDE, associate executive director of New York City Health and Hospitals Corporation's telehealth office, describe the work environment of care managers in the House Calls Telehealth Program program, a blend of telehealth and telephonic case management for patients with diabetes.